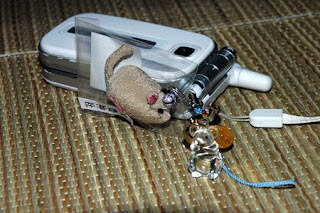 Dear all, I wish you a 2008 year filled by Peace, Love and of course travel in Japan ! Have you ever celebrated new year's eve in Japan ? That's something wonderfull, that's so vivid and colourfull ! I wish you can experience it at least once in your life. There is actually a lot to do and see before and after midnigth if you're here for the new year which is called "oshogatsu" in japanese. Let me introduce what I know about them (which is certainly extremely few compared to all the traditional things that occurs this night). To endure the coldness of the night it's better to start with a very hot and consistent dish. There is a dedicated one, called toshikoshisoba. That's noodle with mochi and various others things. Take care to the mochi. It'so sticky that every year some people died by choking on it !!! 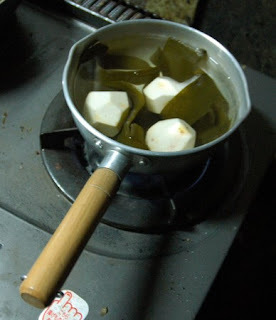 Another typical dishes is ozouni. 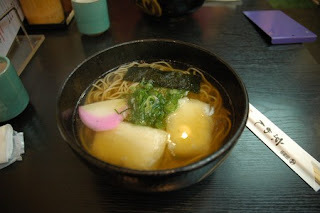 The recipie change in each area of Japan, but basically I would say that's a soup of seaweed and potatoes. If you look for the recipie of each of them have a look a this very interesting page (in japanese only). The white ball are satoimo, a kind of potato, cut in shape of a turtle shell to bring luck. Ring the bell. It's called Joyanokane and that's the most impressive part of the buddhist ritual for the new year. In some temple you can ring it yourself freely, in some others you have to buy a ticket in the afternoon. 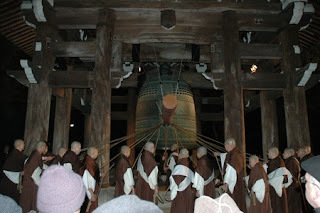 Normally the bell is stroken 108 times to protect people who listen to it from the 108 buddhist sins. The first fire of the year. There is no use for it in our modern time but people keep on doing it. When there was no electricity in the house, fire was of extremely great importance and every house had his small hearth which was well protected. 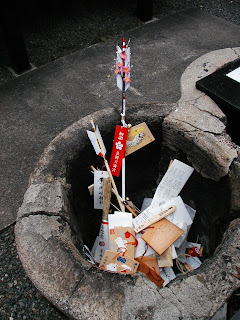 The fire was something sacred and though needed to be purify at a shrine. That's why every year's eve people came to the shrine to light up a little rope and brang it back home to light up the first fire of the year. Gomiki, the sake of the Gods. You can drink in some sanctuary and sometime they even offer you the small cup to drink it. 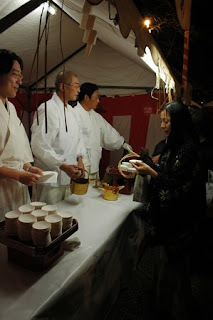 Another typical beverage for new year's eve is called amazake. This is also sake but without alcohol, very sweet, and usually served with ginger. You can also drink it for free in many shrine and temples. Omikuji. This is an oracle for the year coming. There is serveral way to receive it. My favourite one is to shake a big wooden box until a little rod get out. Then you tell to the priest with number was written on it and he gives you this little piece of paper with your future written on it. 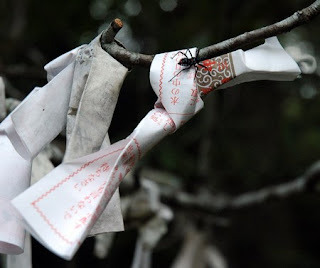 Once read, you tie it somewhere in the shrine to let the wind bring away the bad news. If everything was perfect you can keep it with you. I've seen small trees completely covered by omikuji just like it was snow on the 1st of january. And of course you have to buy new omamori to protect you all along the next year ! And finally you should try to reach the top of a mountain to look at the first sunrise of the year. Then, it will be time to go to bed ... and start again celebration on the first of january with what it's called hatsumode. No time to lose ! !